So we are finally here. 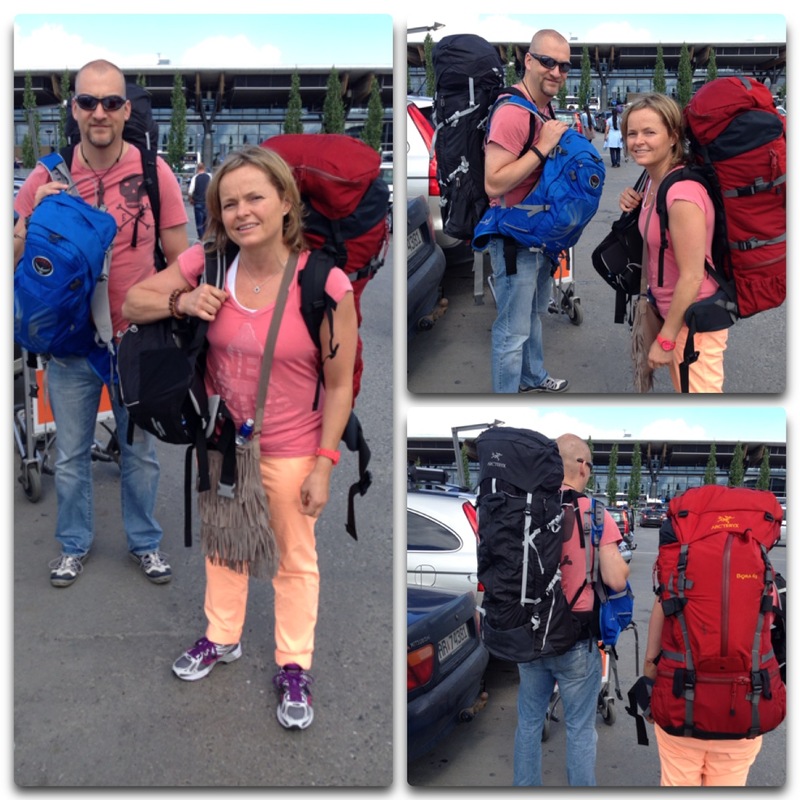 After years of planning, saving money, getting all together… The Asia Tour is up and running. What a feeling. We came in to Bali yesterday afternoon on the new section of the airport. It was opened in 2013 and (fun fact) it took 1 year to build. 1 freckin’ year. In Norway we are building an add on to our main airport as well. I do believe it is schedule to take 4 years. Getting in to Indonesia is not so hard. It requires Visa for travelers from Norway, but as of 2005 you can get Visa on arrival. Norway is among the 52 countries that are on this list of countries who can get that. As immigration control are as slow as for entry to the US it is a question of whether one wants to get quickly in line by getting the Visa at home, or end up at the end of the line. We used appox. 45 minutes in line for getting through immigration. And we had our Visa ready to go. Indonesia practice rather hard punishment for different crimes. Among them 5 years in prison for messing with immigration papers, and the death sentence for drugs. Those pills you found in old aunty Margareths medicine cabinet is maybe not something you would want to bring along. 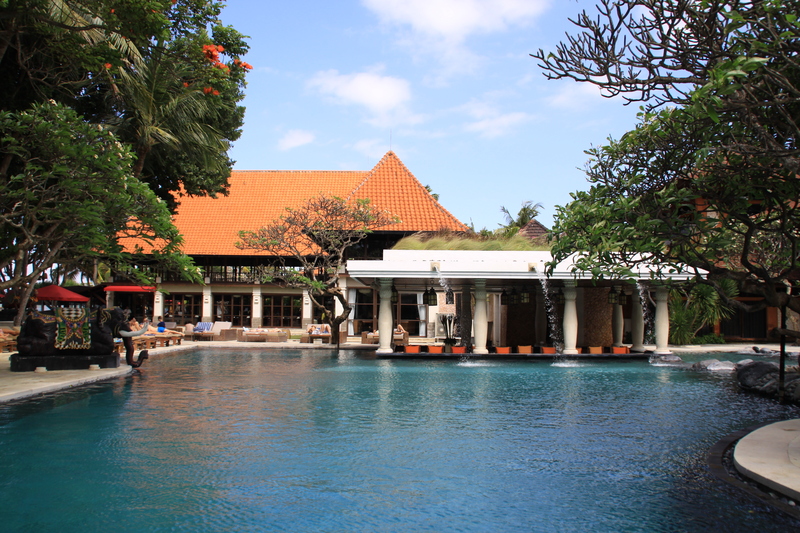 We stay at a hotel called Puri Santrian in the Sanur area. A great place picked by Katja for one specific reason: It has a separate part for “no kids”. What a treat. An own swimming pool is available for us as well. Thanks to Lisa for pointing this out for us. So far we really like it here. In Bali (just as in Jakarta) taxis are divided into two types – Bluebird taxis, and everyone else. Bluebird taxis have earned a reputation for being honest dealers in the often-corrupt taxi industry. Non-Bluebird taxis, on the other hand, are known for dirty tricks – not using their meter and taking roundabout routes, among other things. Bluebird taxis are light blue, with a bird logo enclosed in a rounded diamond, and “Bali Taxi” emblazoned on the side. From experience we can confirm that this is the case. Use Blue Bird if possible, always demand to use the meter, and don’t believe anyone who says it is cheaper to get “fixed price”. As for our day we started out with at 10k run on the boardwalk along the beach. We went out at 7:15 and it was already quite crowded with locals getting busy setting up shop as well as some religious ceremony going on. Most people in Bali are Hindu and we had no idea what they where celebrating (or if they even was celebrating), but they were all dressed in white and it was clearly a family thing. For lunch we tried one of the local warungs, or cafes. 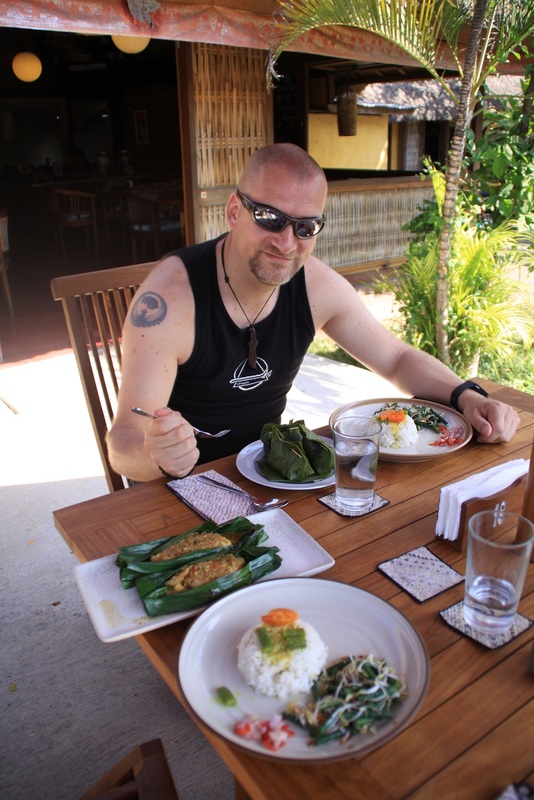 We tried between us chicken and fish baked in banana leaves with rice and vegetables. It was just great. Now it is dinner time, and we will head out in search of suckling pig. It is easiest to get a hold of that on Sundays. More on that later. Categories: Indonesia | Tags: Bali, Indonesia, Sanur | Permalink.